EJ was very excited about the feather… he immediately declared it was from “our” hawk (we have a beautiful hawk that hangs out in our backyard). 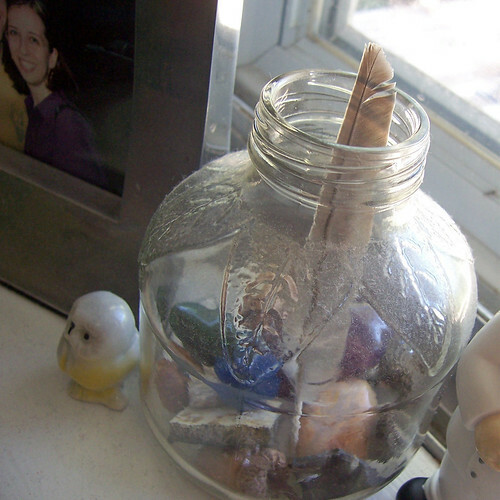 It’s now in my “stone vase” – I realized after the 20th little rock EJ gave me that I would be getting a lot more rocks than flowers… and I love it! 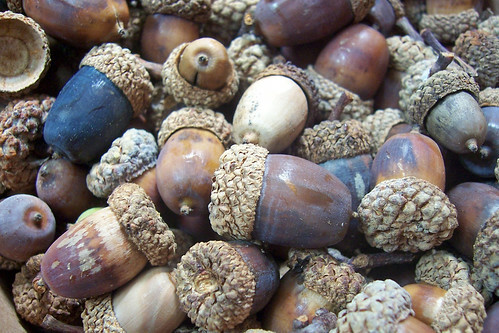 …acorns abound. And they are not only falling – the trees fling the acorns down at us. EJ knows about the acorns falling, so we sat in our front yard on this cool-ish fall day and gathered fallen acorns and flung them back at the trees. Fun fun fun! 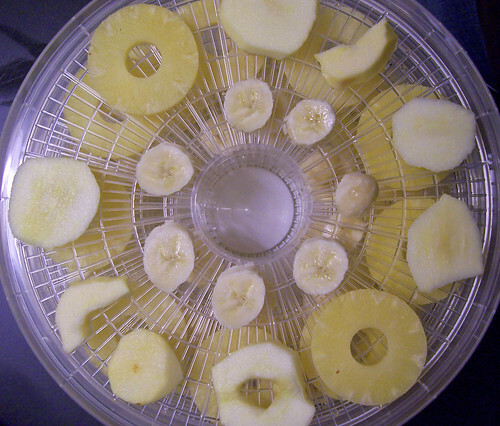 Tonight, I prepped an “F” surprise for tomorrow – fabulous fruit! Does anyone listen to the They Might Be Giants‘ kids’ CDs? Confession: I was a huge TMBG fan in high school… when I heard they had children’s CDs, I got Here Come the ABCsfor EJ. It’s a fun CD, with a lot of bouncy but not annoying songs about the alphabet. For the letter F, there is a song called “Fake-Believe…” and it keeps running through my head. I need to share: “F is for FUN, F is for Fun, F is for FAKE-BELIEEEEEVE!” There – now it’s out. Thanks. … we’re on to letter F! F is for fun, friends, family, flowers, farmer, fireman, football, food, fruit, fox, flag, father, fall, fish, frog… I know I’m leaving some out! We kicked the week off early with some family time! EJ is finally old enough to really be able to play with someone else, which has made the past couple get-togethers with his older cousin tons of fun! They were inseparable, which was fabulous to watch. There was also some football on TV, which was fabulous and fun as well. Today, we went over our F verse, “Do not fear, for I am with you.” (Isaiah 41:10). EJ’s been acting “scared” a lot lately – perhaps a symptom of his age, but it doesn’t help that this age falls in with all the frightful Halloween displays at the store. We’ve always prayed that God would take away all scary things from the house and all scary thoughts from our head, and I thought a simple verse proclaiming God’s power over fear would be a good idea to back all of that up. The verse is also the basis for one of the Seeds Family Worship songs – one that I really like and is easy to pick up. I realized what I was doing wrong with choosing and trying to teach a verse each week – or rather, what I wasn’t doing right. I wasn’t praying about it. I would pray about our week, but not about which verse specifically we should focus on, or how to present it to EJ, or that EJ’s heart would be softened towards the verse. Once I prayed for all of that, the burden just felt like it fell off my shoulders and verses just popped into my head. I am not limiting the verses to the ones in the Seeds Worship CDs, but if it happens to have a song attached to it, I will use the CD to help. Something else I did last week was create a special playlist in our iTunes for the week. I put any and all children’s songs that had important “E” words in it into the playlist, and we had our own soundtrack for the week! It was fun, and not too mind-numbingly repetitive. I’ve done the same this week, and I hope we will enjoy it as much! We’ve got some fun activities planned this week with fruit and family-flowers, and I’m thinking about something firetruck-related. We’ll see if that pans out at all. So, finally, we’re back on track! So, I’m sorry I haven’t been around but I love all the stuff Leigh has been posting! I hope you’ve been keeping up. In an effort for some alone time, I took Lydia to Wal-Mart today. (I know, exciting.) While we were there, I saw that Martha Stewart’s premade kids’ crafts are there now. I’d only seen them at Michael’s or other craft stores. So, I had to stop and look. Then I decided to try one out as a special treat for Lydia…and as a little product review for us! 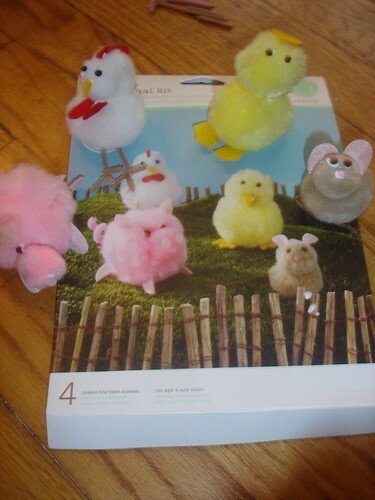 We bought the farmyard animal set–little animals made from pompoms and pre-cut felt. It is made for ages 4 and up. But I couldn’t even get some of it to work. Lydia was only interested in it because it made animals. I ended up doing most of it by myself. I don’t think it was really worth $5 for the quality and cuteness of craft. But I guess it was worth it to have all the pieces cut out and together. Anyway, I’ll let you be the judge. What do you think of our farmyard animals? So, maybe if you’re in a hurry it would be a good buy. Otherwise, I’d just buy a pack of pompoms. You don’t have to be uber-creative to make cute pompom animals. Wait, maybe you do. Because I don’t think ours were Martha-worthy. Oh well. I’ll be back this week with the letter T! I’m thankful for new beginnings… after my struggles last week with the letter D, I was fully ready to move on to the letter E, with all new activities and verses…. 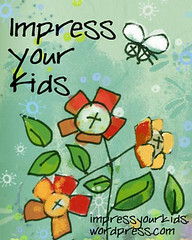 I found a new website that I am having a fun time poking around on… Christian Preschool Printables. 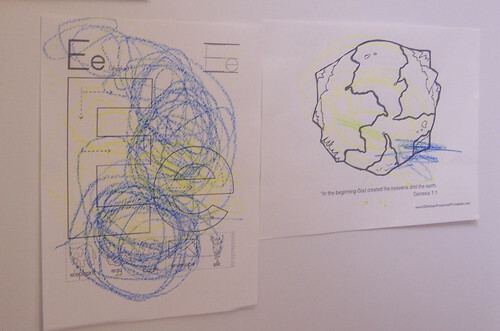 I got the printout of the earth on that site – it also has a wonderful memory verse on it… “In the beginning, God created the heavens and the earth.” (Genesis 1:1). He’s already memorized this one, and I’m still mentally chewing over how the Bible verse is going to work for us and why I’m the one struggling with it. I’ll let you know when I have it all figured out. So, E is for earth, elephant, envelope, egg, and, of course, EJ! The letter E is one he’s known from the beginning, since he’s seen it in association with his name for such a long time. One thing that I think is really interesting – because he’s so allergic to eggs, we don’t have them around much, and he’s never seen one cracked open and raw. So when I showed him a picture of one, he had no idea what it was. But the earth… we hit the jackpot with this one! EJ loves space and the things in it as much as he loves dinosaurs and sports. So we’ve done a lot with the earth this week. 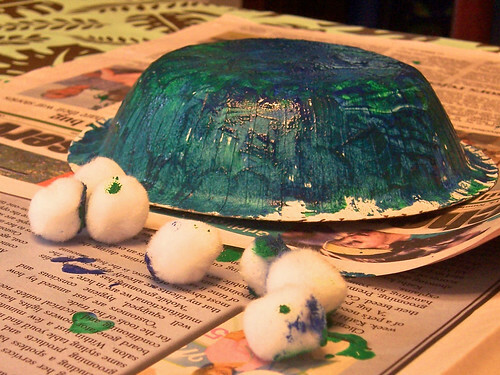 I found some paper bowls in my pantry, and I grabbed our blue and green paint. When I discovered that we were out of cotton balls, I found some little white craft pom-poms… and we made our own earths! Glue once again reigned supreme – at first, there was not much paint on EJ’s earth – gluing the pom-poms down was the most fun. Then, when he discovered how to squeeze the paint out of the paintbrush (it’s in the handle of these great little inventions), the pom-poms were gone, and the earth was covered! He also used the pom-poms to spread and stamp the paint around. 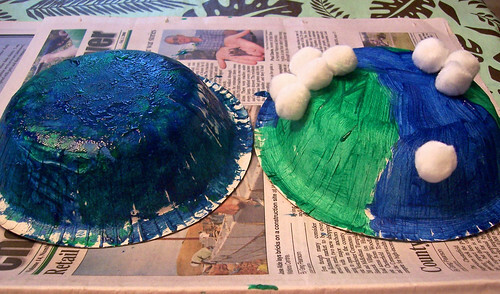 On the right is what I had in mind for the craft, but I love EJ’s interpretation of the earth. 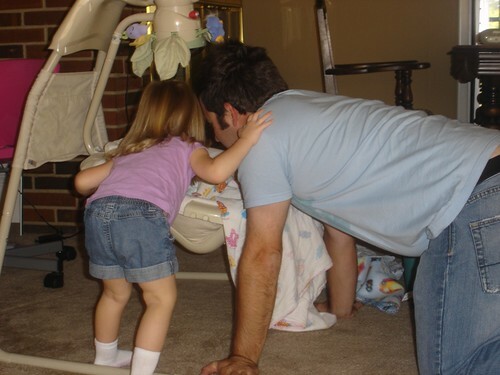 And I loved it when EJ wanted to show his earth to Daddy as soon as he walked in the door. Beautiful!